DOES F1 2018 LIVE UP TO EXPECTATIONS? A few years ago, on a website in a galaxy far, far away, I was fortunate enough to review F1 2016, a game which I thought was rather good! Then in 2017, I managed to get my hands on a copy of F1 2017, this time not to review, but to play for my own pleasure, and again, I loved that too. But now we are in 2018, and F1 are back at it again, with another installment of their franchise… However, with a consistent yearly run for this franchise, my worry is, has the game started to become stale? Thankfully not. 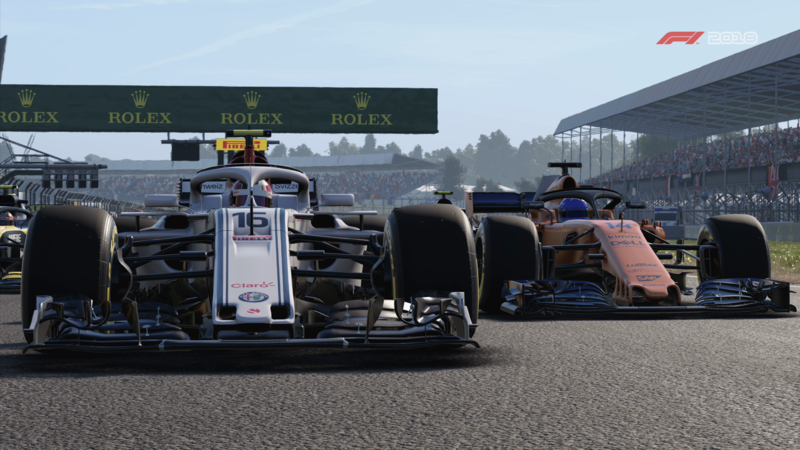 On paper at least, F1 2018 has a lot going for itself; the game features two new tracks that have been added to the F1 calendar, a fan favourite feature has returned, as you can now speak to the press after finishing certain races or qualifying sessions, and of course the rather obstructive Halo has been implemented into the game, but we’ll get on to that in a little bit. The Photomode in F1 2018, can capture some seriously stunning, close quarter, wheel-to-wheel action. Once you boot up the game for the first time, you will first be greeted to the all-new, wonderful soundtrack composed by Brain Tyler, a composer who has scored films such as Avengers:Age of Ultron, Fast & Furious 7, Thor: The Dark World and Fast 5. The song is underlaid to a montage of in-game F1 2018 clips with all of your favourite current F1 drivers battling it out over all of the 21 tracks that feature in the game. It is truly joyous, and really does capture the excitement, pace and drama that Formula 1 can, and does have. There are now a few more characters to select when choosing your single player career character, as well as a few new helmet variants, and audio names which you can select for Crofty to say when talking about your driver in the grid line-up. Rather childishly, I looked straight for something funny, and was left in a state of silly giggles when I found out that the choice of the name of Wang was on the list, and thus chose that. "It is truly joyous, and really does capture the excitement, pace and drama that Formula 1 can, and does have." Now, the Career mode in F1 2018 has had a bit of a shakeup but the basic principle of Practice Session, Qualifying and Race has been untouched. So, once you have created your character and chosen a team to join, you are thrown straight into the 2018 F1 season and are introduced very quickly to your manager, and a new character for the F1 Career mode, Scottish Claire. 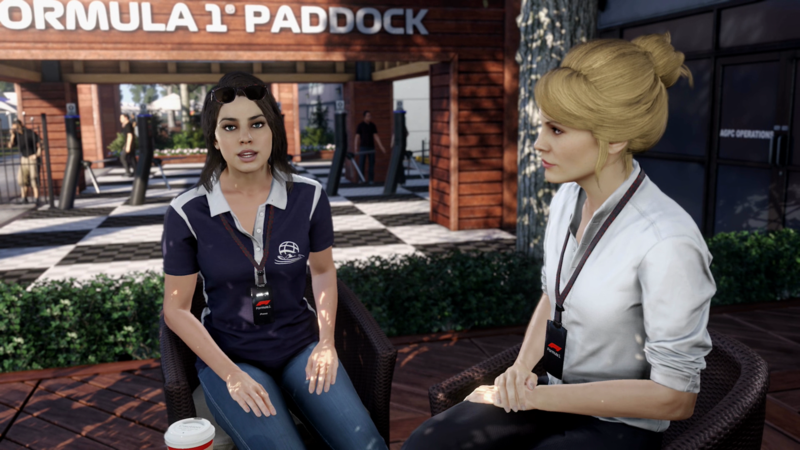 Originally a feature that was in older F1 titles, being able to talk to the Press, is a returning feature that has been sewn into the fabric that is the F1 2018 Career mode. Occasionally after race or a practice session you will be questioned by Claire, to which you have a selection of answers, with only 10 seconds to respond too. Answer them nicely and the team whom you are with will respect you, helping to give certain departments moral boosts. Scottish Claire and your manager. You'll be seeing a lot of these two. Anyway, once you’ve finished your chat with the two ladies, you are then greeted to your mechanic and more importantly, you are greeted to your management screen. Remember the laptop that you had back in F1 2017? 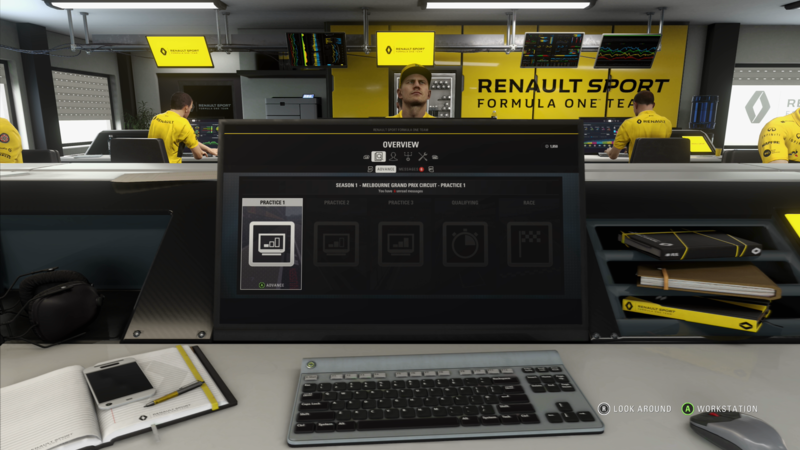 Well it’s that, except now it’s a computer in part of a F1 facility, full of mechanics and boffins, and it’s a nice touch. It might be a small change, but it’s crazy just how much a small change of scenery can improve the game, or at least from my perspective. The practice programmes make their return, with a new additional mode, ERS Management. Like the previous titles, these programmes are merely a way to help you build up resource points for your team to help upgrade your car as the season goes on, which you do using the new and improved Skill Tree. However, I still don’t entirely feel like this system is executed properly. Much like the interviews with Claire, at first these practice programmes are great fun, but after a while the repetition kicks in. Doing the same five minigames every race weekend eventually becomes tedious. Although, despite this I do feel as if it is also easier to earn performance points to help upgrade your car. Whilst it may come across repetitive, it does feel as if you are earning more points in this version of the game, as I found myself upgrading the car an awful lot more on F1 2018 compared to previous editions. This is your workspace for F1 2018. A significate step up from a laptop to say the least. Now, do not think for a second that I dislike this game, because I don’t. In fact. I bloody love it. You see, two years ago with F1 2016 I argued that no racing game out there has AI, in my opinion at least, that is competitive as what that game had to offer. And now with F1 2018, it’s the same case. The AI is fantastic. If you end up picking one of the higher up teams, such as Mercedes, Ferrari or Red Bull, this may not be the case. But, if you pick a mid-pack team, you are in for one hell of a ride. One of my favourite things about the F1 games is that, of course you would love to finish on the podium, but if you don’t you aren’t penalised for it unlike other racing games. And that’s what I find is a key to enjoyment about this game. You don’t feel so bad coming 7th or 8th, but if you do somehow manage to grab a plucky 3rd, 2nd or 1st, it feels incredibly rewarding. You really do feel like you’ve earned it. Battling the AI is truly a joyous experience, either they inch towards you lap by lap, or you gain on them inch by inch each lap. It’s the constant 'will you' or 'won’t you' feeling you get, that you hook onto and play with. And don’t worry if you do happen to crash or make a big mistake whilst gaining on your opponent as of course the rewind feature is still in the game. It’s safe to say, that for a racing game, it seriously delivers on the racing part. "you don’t feel so bad coming 7th or 8th, but if you do somehow manage to grab a plucky 3rd, 2nd or 1st, it feels incredibly rewarding." But, no racing game would be complete without a track list, and like its previous titles, it’s as strong as ever, however this time due to the F1 track calendar change, we now have an additional two new tracks being added to the game. These are the infamous Hockenheim circuit and maze complex that is Circuit Paul Ricard. Both of these tracks look absolutely incredible, and that doesn’t just apply for these two tracks, it applies to all the tracks in this game. Whether you be belting down Hanger straight at Silverstone, or having to floor it up Eau Rouge, sorry that’s Raidillon actually, every track has a unique feel and flow to it. Except Yas Marina, that track is awful in every game. But I digress, as track lists go, it is extremely rich and diverse. One piece of advice I shall give you though. Stay away from the curbs. The curbs on this game are vicious and make the likes of James Bond villains look friendly. As well as this, the HUD UI has had a slight tweaking, changing only the smallest of things, such as fonts or shapes, nothing crazy, but it’s a change that really isn’t too much to fuss about. However, this being said, when you jump into a classic F1 car, it’s another story as the HUD will then be depended as to which car you are in. When I jumped into the Lotus 72D, the little speedometer at the bottom right had changed from the modern, led display, to a more classic speed dial, and rev counter, matching with a monochromatic background to top it all off. Once again, the photomode is also brought back, enabling you to caputre some of the more epic moments throughout your F1 2018 Career. F1 2018 is a truely stunning game. The graphical jump between their previous title and this one is phenomenal. Another thing I noticed about the game is how they’ve ever so slightly tweaked the sounds. You’ll notice when you are going flat-out down a long straight, you will hear the underbody of the car scrape across the floor every now and then. And since I'm on the subject of sounds, all the new music and sound effects you will be familiar with from the TV F1 Sport have now all been implemented into the game too, just to add to that deep immersion that this game delivers to you. 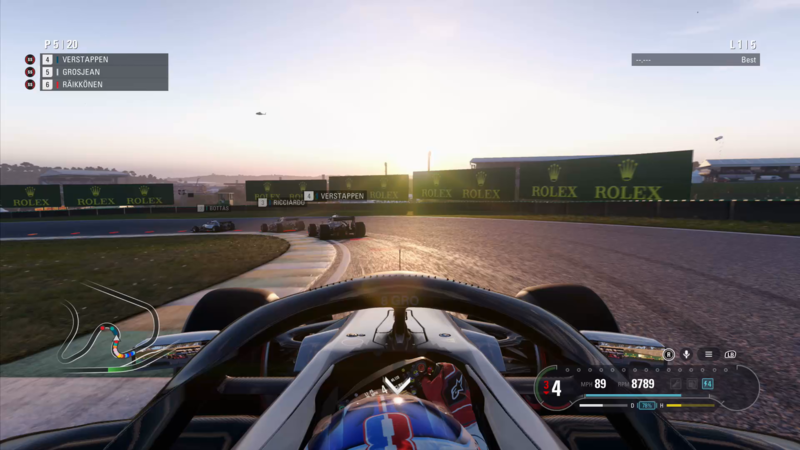 Overall, F1 2018 is without a shadow of a doubt, an improvement upon the last game, but that is to be expected. So many features have been added, albeit they can be a tad annoying, but despite this, the gameplay feels as fresh as ever, the graphics and overall visuals of the game have had a nice tweak, and the AI is some of the best I’ve ever had the pleasure of racing against. And, one last thing I should mention, throughout this entire review I seemed to have forgot to mention the introduction of the Halo! Well… it’s all in good measure, you see I simply forgot about it, in the same way that you probably will too when playing the game, honestly, after a while you’ll forget all about it, you’ll most likely remember more about Crofty saying the word "Wang." That, or the fact you’ll be too busy caught up in the midst of an epic duel with another driver. Despite having the odd hiccup here and there, F1 2018 is by far the best F1 game to date!